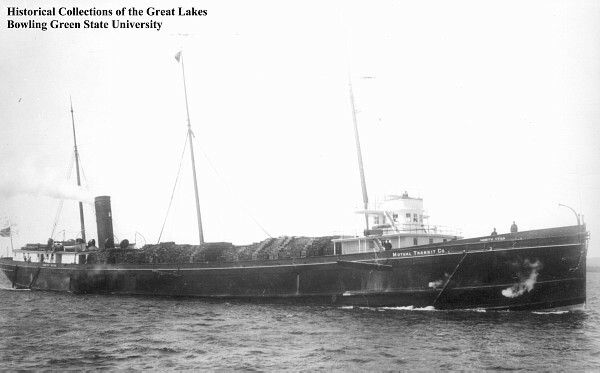 Launched in 1889 as a steel hulled package freighter with an imposing length of 300 feet, the North Star served diligently on the Great Lakes for just over two decades. In November of 1908, she was bound for Duluth in the fog when she collided with her sister ship, the Northern Queen. As a result of that collision, she went down with her full load of grain and shingles in the area of Port Sanilac. She came to rest in two pieces in about 100 feet of water. Today, she is an amazing wreck for intermediate to advanced recreational divers to explore. Some points of interest include; her intact pilothouse, boilers, and engine. We visit the North Star regularly on the Go-Between from Port Sanilac.